My new Tabletop Studio has arrived and I set it up today. Other than an odd plastic smell emanating from them, the pieces were packed very well and easy to put together. The tents themselves look like square white laundry bags, the kind I bought for my daughter when she went off to college. My setup came with a 12″ and a 20″ cube. They both fold up flat and fit into a nifty carry bag. I’ll probably use both cubes since I’m photographing jewelry. I didn’t get any of their graduated backgrounds yet so I used some brightly colored fabric I had. Even though the fabric matches the necklace, it’s probably too brightly colored for this purpose. I do love that green though! The light is nice and even and shows off the beads pretty well. I closed my aperture way down (f16) to get maximum depth of field and used a manual focus. For comparison, I took a shot in full sun. It’s way too harsh with many shadows and the colors in the necklace are all bleached out. It does show the texture in the raku flower pendant that the Tabletop Studio shot did not. So, even though the sun shot has more dimensionality, it’s not good for the purpose intended here. This is the same shot but I put a piece of printer paper between the sunshine and the necklace. Oh yes, I also turned the fabric over to see what the other side would look like. 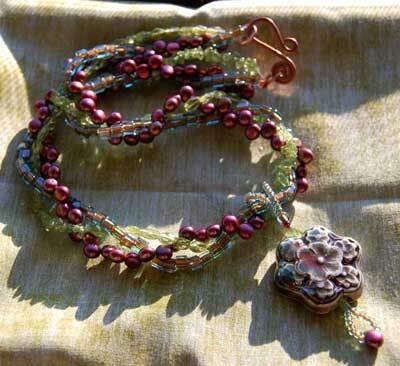 Actually, I like this shot a lot because it shows off the colors in the necklace and the texture in the pendant. Since I didn’t have the camera on the tripod, I couldn’t close down the aperture like I did with the Tabletop shot so it doesn’t have the same depth of field. I also used the auto focus mode for the 2 sun shots. Open stock paper is on sale at A.C. Moore this week so I’ll go choose some different backgrounds and continue to experiment. I’ve named my necklace “Secret Garden” because the pendant and the colors remind me of one of my most favorite childhood stories. I acquired the raku pendant during a trip to the Big Island of Hawaii 3 years ago. 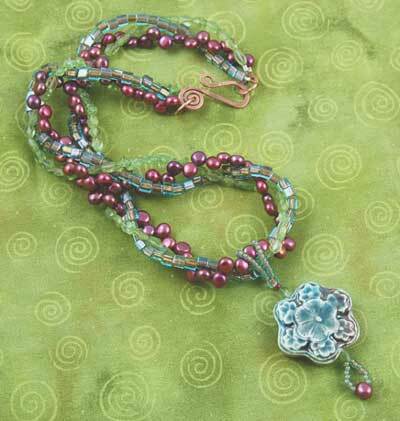 The braided necklace strands are peridot, pearl and square bronze-lined aqua glass beads. 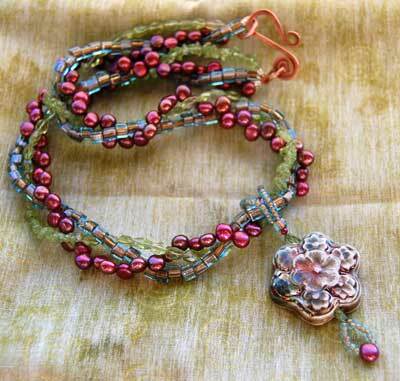 I created the clasp from 16-gauge copper wire. I also made a matching bracelet and earrings. Stay tuned for their photo shoots! This entry was posted in Jewelry, Photography.